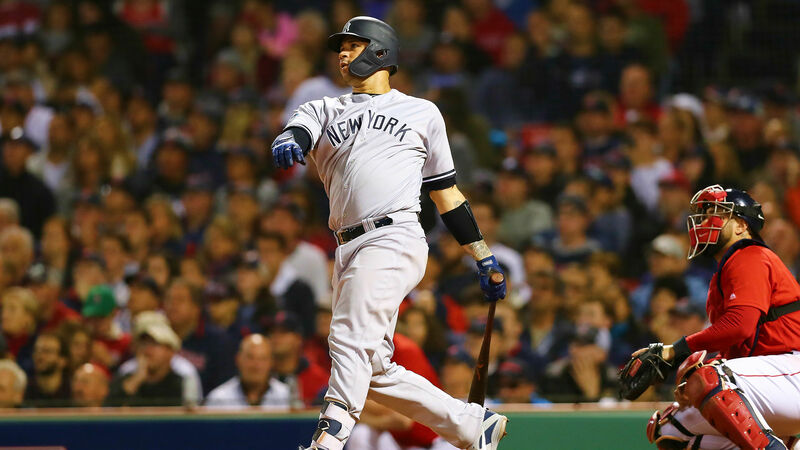 Sporting News provided updates and highlights during the Yankees’ Game 2 victory. 11:05 p.m.: Heath Hembree comes in to pitch for Boston. Christian Vazquez will come in to catch. Moreland appeared to hurt his hamstring after scoring in the last inning. He’s subbed out and Steve Pearce will take over at first. 10:46 p.m.: The call is overturned after review and Voit is called out, so it’ll be runners at first and third with one out and Sanchez at the plate. 10:44 p.m.: Stanton hits a chopper to the left side and it’s fielded by Nunez. He throws to second but Kinsler’s foot is off the bag as Voit slides in safely. The play is under replay review. 10:42 p.m.: Voit follows Judge’s single with a walk. Stanton will come to the plate with two runners on and no one out. 10:39 p.m.: Judge hits a chopper up the right side of the infield and Moreland leaves first to field it. Rodríguez doesn’t make it to first in time to cover the bag and Judge leads off the inning with an infield single. 10:35 p.m.: End of the sixth inning. Betances pitches a perfect frame and we’re on to the seventh. Yankees lead 3-1. 10:32 p.m.: Tanaka’s final line: five innings pitched, three hits, one run (one earned), one walk, four strikeouts, one home run allowed, 78 pitches, 48 strikes. 10:31 p.m.: The Yankees make a pitching change. Tanaka’s night is done and Dellin Betances will come in to pitch the sixth. 9:56 p.m.: Voit draws a walk and now Stanton’s up with two runners on. 9:32 p.m.: Kelly pitches a perfect inning and it’s on to the bottom half of the inning. 9:02 p.m.: End of the second inning. The Red Sox go down 1-2-3 and we’ll head to the top of the third. Yankees lead 3-0. 8:51 p.m.: Yankees scoring play. McCutchen singles to left off the Green Monster as Torres scores from second. Gardner moves to third. The Red Sox make a pitching change as Price’s night is done. Joe Kelly will come in to face Judge. Yankees lead 3-0. 8:39 p.m.: Yankees home run. Gary Sanchez hits one over the Green Monster to extend the Yankees’ lead. Yankees lead 2-0. 8:28 p.m.: Tanaka’s first pitch to Mookie Betts in the bottom of the inning is called a strike. 8:15 p.m.: Price’s first pitch to Andrew McCutchen is called a ball outside. They’re underway at Fenway. 7:04 p.m.: Lineups for tonight’s game. First pitch is scheduled for 8:15 p.m.